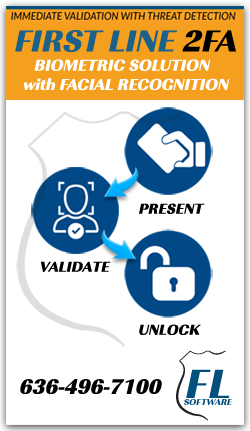 First Line Software is an intelligent facial recognition, security software that provides automatic, real-time, identification verification for threat detection, access control, and concierge applications. Because safety and security are important everywhere, First Line has a robust service distribution suitable for many industries. First Line software uses high-quality, high-resolution, digital security cameras that capture images as people walk up to the camera. Software triggers an indicator light on the camera to signal when a face has been read. Captures 30 digital frames per second. Uses infrared in low light situations. Can recognize faces even when they are tilted away from the camera by as much as 15 degrees. More than 350 facial points are used to match images using Blue Line’s facial matching algorithm (patent pending). Cameras can be mounted on walls, ceilings, stands, turnstiles, or metal detectors. There is also a portable system that can be set up in around 15 minutes. Compatible with AXIS Communications ONVIF Profile S. ONVIF is the leading standardization for IP-based security products. Output pairs with existing access control hardware. Cameras are powered over the Ethernet. Can be integrated with Network Video Recording systems. First Line offers a variety of appliances to stream your cameras’ real-time video feed. There are up to 8 configurations to accommodate different size databases. The system instantly categorizes the Known, Unknown and Alert status for each person’s face it processes. Security appliance stations can be positioned at the entryway for centralized viewing although First Line’s intelligent facial recognition software works without anyone watching. Records the video stream for later playback. Keeps video streams for 3 days. System monitors for Known, Unknown or Alert events and can be programmed to send alerts by text and email. You can set notification rules and schedules. Indicator lights (Red = Alert; Yellow = Unknown; Green = Known) can be seen at a glance on the security appliance station screen. Adding images to the database takes less than 30 seconds whether using the appliance or via First Line’s secure web portal. Installed on site so you always have control of your data. First Line offers a choice of data management (servers) for small, medium and enterprise installations. The First Line software and appliances are installed at your premises, so you always have control of the data and its security. The system is configured to meet your company or institutional IT policies and runs on your local network for domain naming requirements. Secure backups can be scheduled on First Line’s data management servers. Each installation of First Line requires a network connection.